Paul Chaplet, Champion of the 2016 Latin America Amateur Championship at Casa de Campo. Sunday January 17th, 2016. Enrique Berardi/LAAC. 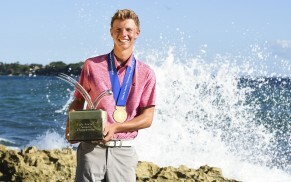 Paul Chaplet, of Costa Rica, executed a delicate chip shot that led to a tap-in birdie on the 485-yard, par-5 14th to take a one-stroke lead, then outdueled a tightly bunched group of players down the stretch to capture a one-stroke victory, winning the Latin America Amateur Championship with a 3-under-par total of 285. With the victory, Chaplet earned an invitation to the 2016 Masters Tournament, as well as exemptions into The Amateur Championship (conducted by The R&A) and the U.S. Amateur Championship (conducted by the United States Golf Association). He also earned spots in final qualifying for The 145th Open Championship and the 2016 U.S. Open. After two pars to start his day, Chaplet made a tap-in birdie on the 534-yard, par-5 third hole. He added back-to-back birdies on Nos. 7 and 8, but made his first bogey of the day on the difficult par-3 13th hole, which had as many bogeys (21) as pars for the day. On No. 14, the easiest hole of the day with a 4.54 stroke average, Chaplet was determined to get the stroke back. His second shot on the par 5 went over the green and left him with a slightly downhill chip to a green that sloped away. He executed it with perfect touch, and later called it the crucial shot of the day. The closing four holes of Casa de Campo played an average of two strokes over par for the 50-player field on Sunday, so Chaplet’s bogey after missing the green to the left on the par-3 16th was not unexpected. He made a pair of solid pars on Nos. 17 and 18. Jorge Garcia, of Venezuela, who was tied with Chaplet as he played the par-4 17th hole, hit his approach shot into a fronting bunker and made bogey. Garcia played a brilliant approach shot to the final green, but missed a 10-foot birdie putt that would have forced a playoff and finished at 2-under 286. Opened in 1971 and designed by Pete Dye, Teeth of the Dog at Casa de Campo features seven holes along the Atlantic Ocean and is routinely ranked as one of the best courses throughout all of Latin America. Casa de Campo was named the number-one golf resort in the world by the International Association of Golf Tour Operators (IAGTO) for its collection of golf courses, professional facilities and commitment to service and exceeding guest expectations. No weather delays occurred throughout the week. Following afternoon clouds and a few sprinkles on Thursday, Friday brought the coolest morning of the week, with lows around 20 degrees Celsius. Winds from the south kept clouds inland over the weekend, providing plenty of sunshine and highs around 30 degrees Celsius.